Switching coasts from Brooklyn to Portland gave architects Mitchell Snyder and Shelley Martin a new set of unexpected clients: three young hens. Their move brought about an entirely different lifestyle--one that involved a house, a yard, and for Snyder, the chance to launch his own firm, Mitchell Snyder Architecture, after first acquainting himself to Portland, Oregon, as a designer at Scott Edwards Architecture. His first project on his own: a chicken coop for the couple's new feathery friends. This cool coop is by David Rosen, an Associate Producer at CBS News in New York. His goal, in addition to sheltering four egg-laying hens, was to design a structure that complemented his house, a modern barn in Rockland County. The main house uses new and salvaged lumberyard materials, including an inexpensive sliding window from Lowe’s. There's a planting box under the window. The sleeping area is completely insulated with rigid foam sheathing. For cold nights there is a heat lamp. Architect Keith Moskow, a partner at Moskow Linn Architects for more than 20 years, and cofounder Robert Linn decided it was time to help a new generation of designers. Earlier this year, they established Studio North, a design-build branch of their practice, and with five eager students, created and constructed the Chicken Chapel. The entire structure takes on the look of a Japanese lantern in the evening. The team added lights so you could go in and be able to see where you are at night and also so that come late fall and winter, Moskow can turn them on after the sun sets to maintain the chicken's waking, eating, and egg-laying hours even as the days shorten. Architecture Reseach Office's 60-square-foot chicken coop streamlined a Hamptons backyard: the concept was to create a series of folded shingles, textured pieces of aluminum that would complement the more rustic aesthetic. Radiant heating, one of the structure's amenties, is a coop must-have, according to the architect. 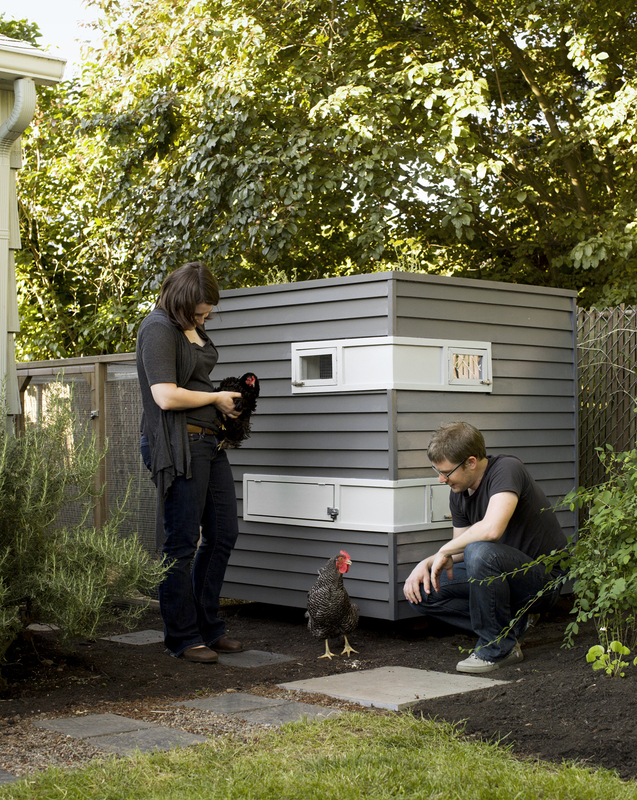 Originally appeared in What If A Modern Architect Designed a Chicken Coop? Research municipal ordinances to make sure it’s legal to raise chickens on your lot. Ask your neighbors if they’re okay with hearing the occasional cluck from your hens. Remember to share an egg or two with your neighbors if they agree. Buy or design a coop without consulting a resource guide first. We recommend Reinventing the Chicken Coop, by Kevin McElroy and Matthew Wolpe and The Chicken Health Handbook, by Gail Damerow and Jeanne Smith, both from Storey Publishing. Get a rooster unless you’re miles away from neighbors.